7 Kids and Us: Mickey Mouse Clubhouse Around the Clubhouse World Giveaway! 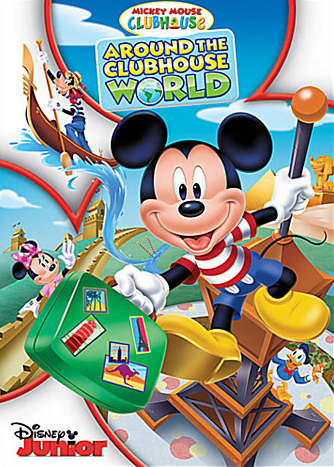 Mickey Mouse Clubhouse Around the Clubhouse World Giveaway! Climb the Eiffel Tower in France and say ''bonjour'' to Mademoiselle Daisy and Monsieur Donald Duck. Then, rescue Gondolier Goofy when he goes adrift in Italy's Grand Canal; solve the mysterious riddle of Pharaoh Pete's pyramid in Egypt, and meet a dancing dragon at the Great Wall of China. With your help - and the right Mouseketools - your Clubhouse friends can get their special passport stamped at each wonderful location. Featuring over two hours of song-filled fun, including four additional episodes, this global adventure proves it's a small world after all! My boys are such big fans of Mickey Mouse Clubhouse..I know they are just going to LOVE this new DVD! Check out the crafts you can do here. Enter using the rafflecopter form below, and you might win a copy of your very own! My son loves Phineas and Ferb! Both of my girls love Minnie.